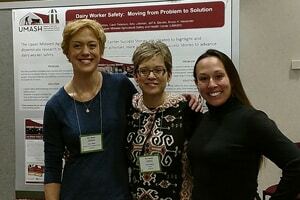 The Midwest Rural Agricultural Safety and Health (MRASH) Conference was held November 14 and 15, 2017 at Central College in Pella, Iowa. Over 70 agricultural safety and health professionals attended to learn more about Best Practices for New Horizon. Carol Peterson attended and featured a UMASH poster – on our collaboration with our partners. This poster showcases our UMASH success stories accomplished in the dairy industry. It was an opportunity to discuss our educational projects and products developed as well as to highlight our future goals for UMASH.